Paris has some of the most internationally renowned museums and art galleries, representing spectacular art and material culture from all over the World, past and present. But what of the history of Paris itself? Most of us at some stage or other have learned about the French Revolution and know of the storming of the Bastille. Archaeological sites and museums relating to the prehistoric and ancient past, however, feature less on lists of must-see places to visit in Paris. If archaeology and the more distant past is your thing, here are my recommendations for five places you should not miss. 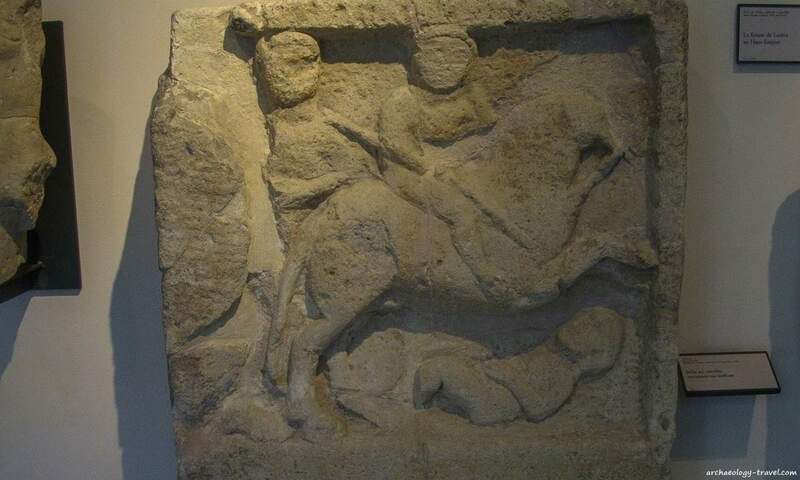 A sculptured tombstone recovered from what would have been a Roman era cemetery on the southern edge of Lutetia, now in the Carnavalet Museum. Although occupation of the broader Paris basin extends back tens of thousands of years into the Stone Age, the banks of the Seine River and the island on which we now see the Notre Dame cathedral has been settled continuously for about 12,000 years. Paris takes its name from the Parsii – an Iron Age Celtic tribe who settled on the Île de la Cité around 225 BC. Here they built a fort and bridges across the Seine River, minted coins and traded across Europe. Their time on the island, however, was short lived. In 52 BC they were defeated by the Roman army led by Titus Labienus. 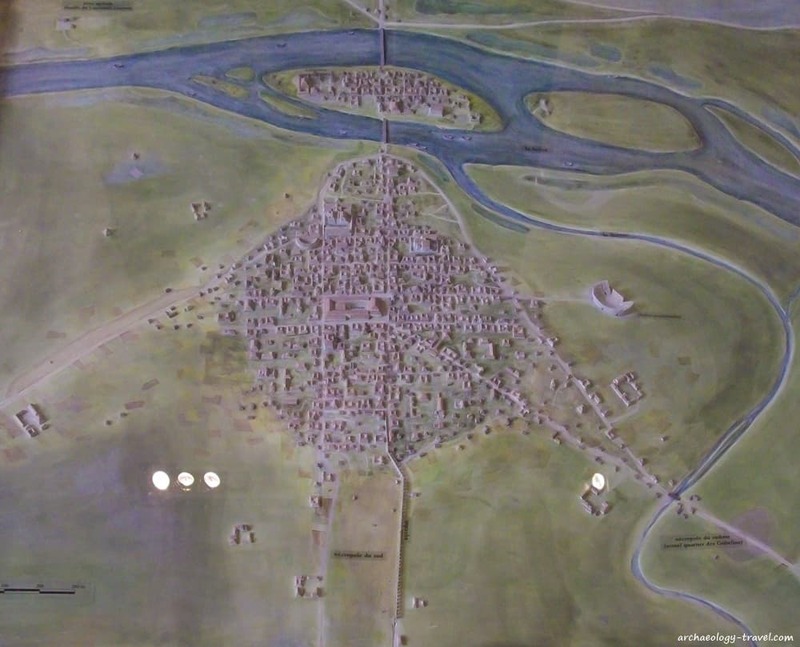 In typical fashion the Romans established a garrison town and named it Lutetia Parisiorum (Lutece of the Parisii). Towards the end of the 3rd century, Lutetia came under fire from Germanic tribes. The last of the Roman army was defeated by the Franks towards the end of the 5th century, and in 508 AD Paris became the capital of the Franks. While Paris tends not to be associated with the Stone Age or the Romans, the archaeology of these early periods of the city’s history ranks amongst some of the most important in north western Europe. And the good news is, there is much to see to make up at least a day or two exploring Paris’s prehistoric and ancient past. 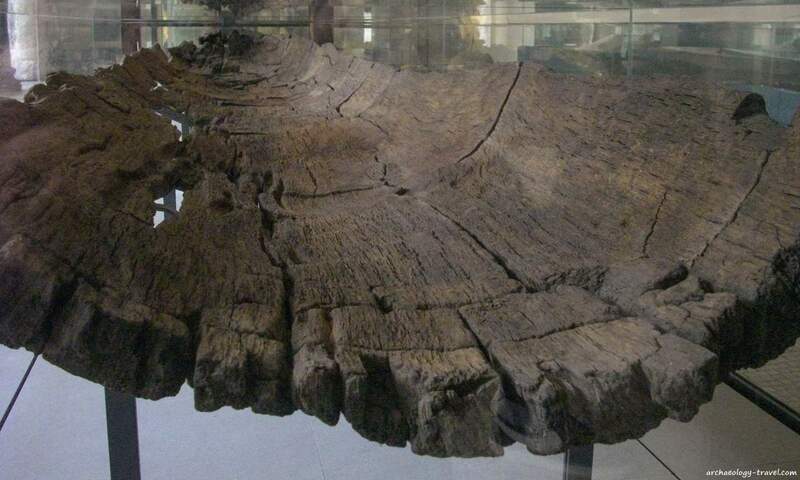 One of the Neolithic wooden canoes found in Bercy on the left bank of the Seine in 1991, some 6,600 years old. Some of the oldest artefacts from the earliest settlements in Paris can be found in the trendy Marais District. What were once two posh town houses are now the oldest municipal museum in Paris, which is home to over 600,000 objects exhibited in around 100 rooms. One of these galleries is the archaeological collection, objects from the earliest times to the Gallo-Roman and early Medieval periods. Finding this gallery is not straight-forward. You have to follow a circuitous, but fascinating and well sign-posted route through many of those galleries telling the story of the history of Paris through changing interiors. If it is only the more distant periods you want to see, your perseverance will be rewarded. Once you reach the archaeology gallery, there before you are the remains of wooden canoes thought to be around 6,600 years old. These extraordinary canoes, amongst the earliest in Europe, were recovered near the Left Bank in an area called Bercy. Excavations there uncovered evidence of human habitation of Paris going back some 11,000 years (Mesolithic). Besides engaging displays of the ceramic vessels and stone tools found alongside the wooden canoes, much of the archaeology gallery is taken up with artefacts relating to the Gallo-Roman period. These include carved stelae, fragments of wall paintings and numerous small, bronze figurines. One of the most intriguing objects is an Egyptian shabti that was recovered from a Roman grave; evidence that Paris has always been well connected. Looking into the arena of the Roman amphitheatre. 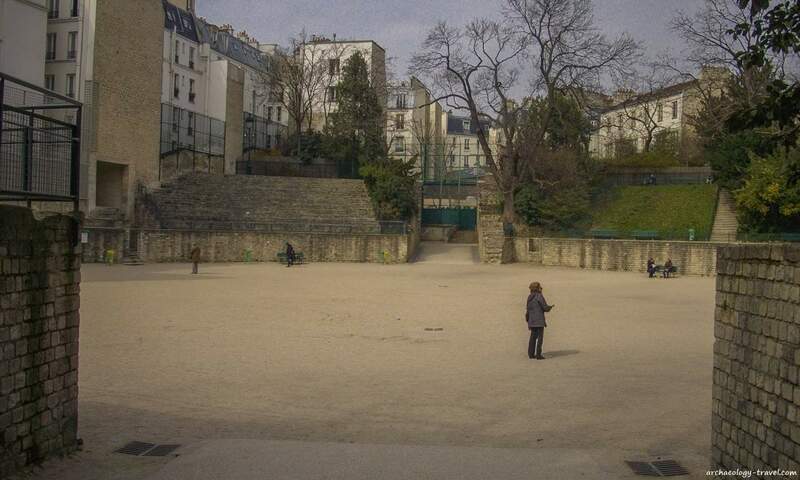 Often described as one of the hidden historic gems of Paris, many visitors talk of how they stumbled upon the Roman amphitheatre quite by chance. This is because walking in the Latin Quarter there is nothing to indicate that behind the five-story buildings that line the streets is a heavily restored open area that follows the shape and structure of the ancient arena. Known locally as Les Arènes de Lutèce (the arena of Lutetia), its was re-discovered in the 1860s during building work in the area. Thanks to a campaign lead by none other than Victor Hugo, the amphitheatre was restored and opened as a public park in 1896. The Colosseum it is not, neither in size and grandeur, nor form and function. Unlike the Colosseum, the Parisian counterpart was both theatre and amphitheatre. There was a break in the east side of the cavea to make way for a stage with a scaenae frons – the base of which you can see. Together with the Roman bath house, these are the most substantial remnants from the time when Paris was a Provincial town. The substantial, above-ground remains of what was a public bath house in Roman Lutetia. 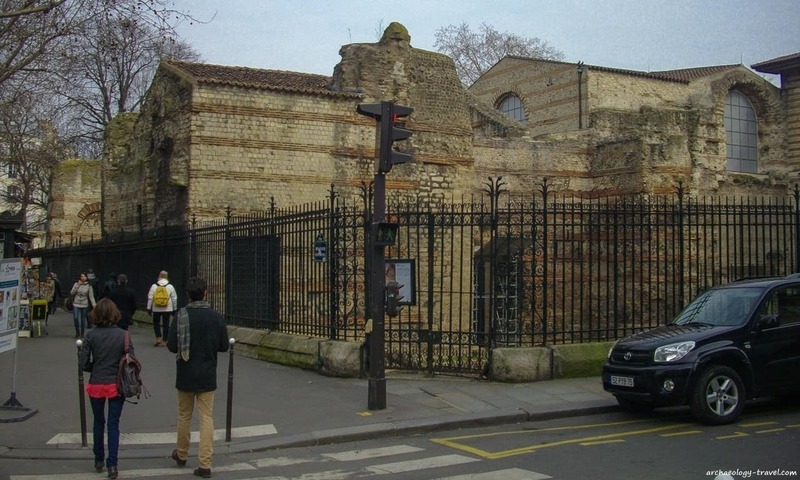 The public bath house that once stood in the northern part of Lutetia is not only the best preserved Roman construction in Paris today, it is one of the most monumental Roman structures still standing in northern Europe. Even during its heyday this was a grand building, and it was here that Julian the Apostate was crowned emperor of the Roman Empire in 360. Following the fall of the Empire, the bath house became a palace for the early Frankish kings. Despite being partially destroyed by the Vikings and various Barbarian groups, the Palais des Thermes was bought by the Cluny Abbey in 1340. Towards the end of the 15th century the Hôtel de Cluny was built as the residence for the abbots of the monastic order of Cluny; the surviving Roman remains served as barns. In 1810 the vast frigidarium (cold baths) with its 14 metre high vaulted ceiling became a museum of antiquities, while the Hôtel de Cluny became the national middle ages museum. Today the frigidarium and the gymnasium are used as galleries in the museum. Included in these galleries are a number of Gallo-Roman sculptures and mosaics. Ruins of the caldarium (hot water room) and tepidarium (warm water room) can be seen from the streets. Below-ground structures that have survived include a network of vaulted tunnels that supplied water, the sewer passages, as well as service rooms. Following many complaints Paris’ oldest cemetery, Le Cimetière des Innocents (the Cemetery of the Innocents, in the Les Halles area) was closed in November 1785. Not only were new interments prohibited, it was also decided that existing human remains would be removed because of the risk of infection to inhabitants of the area. But where do you place the bodies from ten centuries of burials? Beneath the streets of Paris is a large labyrinth of tunnels and galleries created when the limestone was quarried to make the magnificent buildings we still see today. The Louvre and Notre Dame Cathedral, for example, are just two well known Parisian landmarks constructed using limestone from underneath the city. This disused maze of passages then were a perfect candidate for an ossuary. In April 1786 the tunnels were consecrated, allowing for the remains from the Cemetery of the Innocents to be re-interred there; a task that took two years. 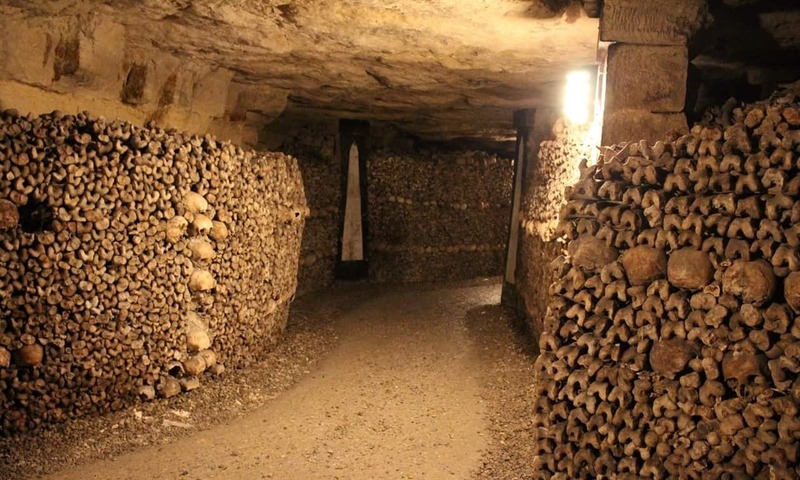 In the decades that followed human remains from other Parisian graveyards were also removed to the Paris Catacombs. Varying estimates suggest that anywhere between six and seven million individuals have their remains interred in the Paris Catacombs. While the human remains are not that old, the quarries in which they are interred were started by the Romans. The stone they quarried from these passages was used to build the town of Lutetia. 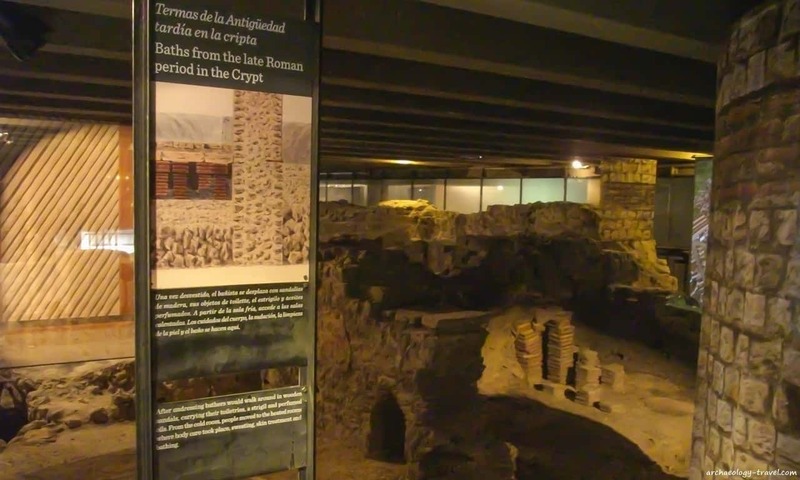 Remains of the bath house are greatly enhanced by multimedia displays in the archaeological crypt beneath the Notre Dame Cathedral. Notre Dame Cathedral on the Île de la Cité is one of the most popular attractions in Paris. And with good reason, the sculptured front façade is quite something. Beneath the parvis you are standing on while admiring that façade is an archaeological crypt containing 2,000 years of architectural history. During excavations to create an underground parking facility, builders revealed the remains of buildings that existed on the island before the construction of the cathedral began in 1163 AD. Coins bearing the name of the Gaullish Parsii tribe are a testimony to Iron Age occupation of the island. Clearly visible is a port and a bath house from the Roman period, as are remains of 4th century ramparts built to fortify the island against Barbarian attacks. And above these remnants are the roads and merchant houses of the Middle Ages. Being in the quite sizeable crypte, you get an idea of just how big the Île de la Cité actually is and how it enabled communities through the ages to live here. Without hesitation, this is one of my favourite places to visit in Paris. I am fascinated by the presentation of archaeological remains discovered during contemporary construction works. And this really is one of the best I have seen anywhere. What could be a dark and dingy space with hard to decipher ruins, is made quite extraordinary with some clever use of multimedia – bringing back to life the ancient heart of a wonderful city. Please note, because of the nature of this site, the crypt is not accessible to wheelchair users. Like most municipal attractions, the archaeological crypt is closed on Mondays, and is only open until 6 pm (last admission at 5.50 pm). These five places are just the tip of the archaeological iceberg. There are so many more museums, attractions and features in Paris for those with an interest in archaeology. You certainly know about the ancient Egyptian obelisk from Luxor now on the Place de la Concorde, but for something a bit different, have a look also at the influence that ancient Egypt has had on Parisian architecture, particularly if Egyptian Revivalism interests you. The different museums often have temporary exhibitions that feature archaeology from other areas of France and elsewhere, for further details consult this list of temporary exhibition in France. You will find more ideas and suggestions for what to see and do in Paris as well as as some helpful travel tips in our Paris Guide for archaeology and history lovers. Model of the Roman Provincial town of Lutetia, in the Carnavalet Museum. 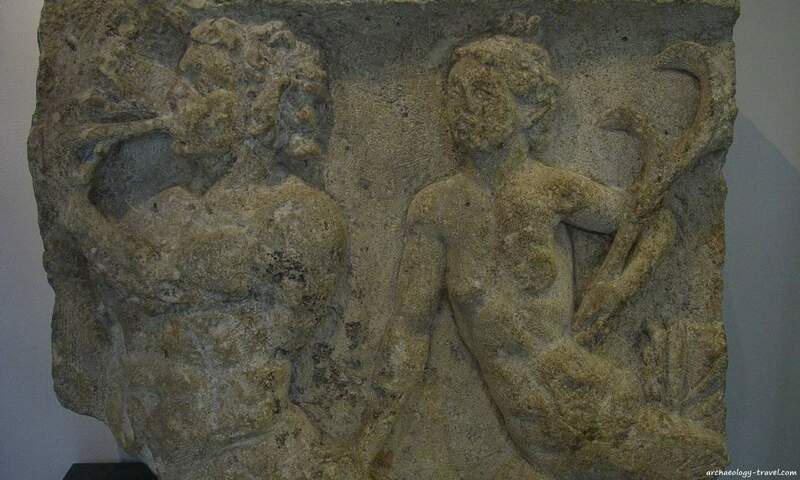 Triton and Nereid, ancient Greek sea god and sea nymph, recovered in 1987 on the Île de la Cité and now in the Carnavalet Museum.